The 23-year-old rewarded Mowbray with a two goals to seal Boro's first away points of the campaign. "Every day in training we've had to calm him down a bit, he's been bursting out of his shirt to show us he wants to start," Mowbray told BBC Tees. "He was a real handful tonight and gives us a platform to play off." Mowbray added: "If you've got people like [Marvin] Emnes, [Mustapha] Carayol and [Josh] McEachran who are really clever, creative footballers sometimes they need the ball up that end of the pitch to be able to play. "If you can play off Jutky and get people running at people off him in the final third then you've got a real problem [for the opposition]." Victory at Ewood Park ensured Boro bounced back from Tuesday's 4-1 defeat by Blackpool, and marked the third game in a row for Kevin Thomson. 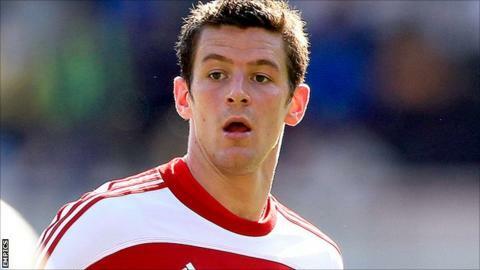 Thomson has suffered serious ankle and knee injuries in his time at the Riverside, limiting the Scotland international to just 13 starts last season. In addition Jonathan Woodgate completed his third game in seven days to boost Mowbray's squad. "It's great to see Thomson get 90 minutes," Mowbray said. "I'd have to say Jonathan [Woodgate] after the Ipswich game said he was beaming, felt decent and wanted to play all three games. "That's full credit to him, we took six points from nine from what on paper looked a really tough week. "This team is growing still, we're still finding out the best way to play with the players we've got and there are some tough choices for me every week on who to leave out."